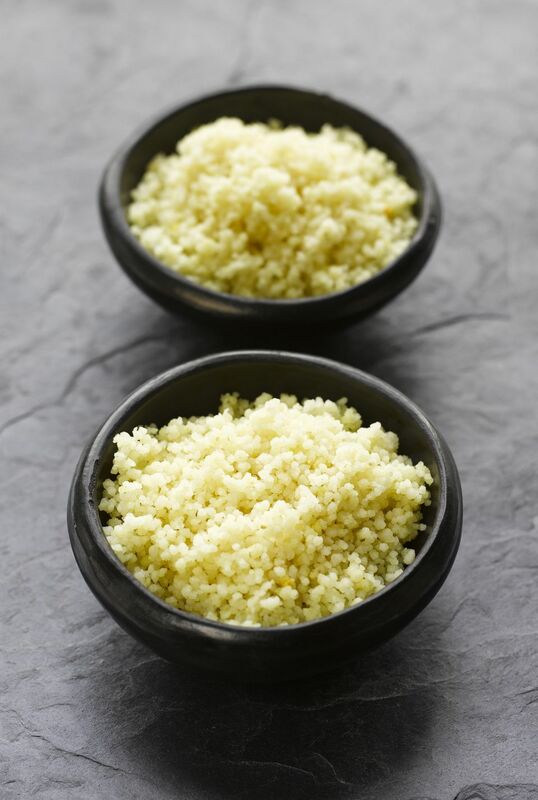 Although couscous looks like a type of rice, it is a pasta—tiny little balls of semolina pasta. Couscous originated in North Africa and is a staple on Moroccan and Tunisian tables, as well as other surrounding countries and parts of the Middle East. Traditionally, couscous is prepared by steaming, but what we find in our local markets is essentially instant couscous. The cooking method is very simple—after the liquid has boiled, add the couscous, cover and remove from the heat. Let sit for five minutes, and there you have it—the base for a variety of delicious dishes. Because of this, it makes a wonderful and quick side dish and can be combined with a wide variety of vegetables, fruits or nuts, as well as topped with meat, chicken or shellfish for a hearty one-dish meal. This recipe is very simple, using light coconut milk as part of the cooking liquid (to save fat and calories) and a small scattering of green onion to give it color as well as a little bit of sharpness to counteract the sweet coconut taste. Pour the coconut milk, water, and salt into a medium-sized saucepan. Bring the mixture to a boil over medium-high heat. Pour the couscous into the coconut milk mixture, remove from the heat, cover the pot with a lid, and allow it to sit for 5 minutes. Add the chopped green onion to the couscous, and fluff with a fork. Serve as a side dish or top with vegetables, meat or fish for a complete entree.